Why one shouldn't play the 6th string of an A chord on guitar? Well everything is in the title: Why one shouldn't play the 6th string of an A chord on guitar? As you may see on the diagram above we are supposed to strum the 1st string. But the 1st one is the same as the 6th one. So this is why I don't understand why we don't strum the 6th string on the A chord. You can play it; you'll be playing the a second inversion of the A major chord, with the fifth (E) in the bass. In many cases, an 'A' notated as the chord is intended to also indicate that A is the bass note. If that's the case, you might want to avoid the low E string, and ensure that the lowest note is A (especially if playing the piece solo, without a bassist) to get the correct movement of the 'bassline' from one chord to the next. As topo says, you can. In fact, sometimes, you have to. If you are playing a bar of A, and the accompaniment is open A, A chord, open E, A chord, it's what you do. Yes, often, the chord sounds better without the V underneath, but if you're strumming along to something, and yoe happen to hit tha E as well, it won't be wrong. A lot of the chord windows try to show chords in root position, as this is.Open C is another, yet with a G on bottom string, it's not bad at all. Same goes for all the barre chords that use the A shape - Bb on fret 1, B on fret 2, etc. Even when strumming a chord, the notes aren't played simultaneously. There will be a time when only one string is sounding. Consequently, since the first string which is plucked will be more noticeable than all the others, one should try to make that be the note one wants to be most noticeable. The two most important notes in the A major chord are usually the A and the C#. The A is what establishes the chord as some kind of A chord, and the C# establishes it as a major chord. Further, if the chord is being used as the dominant for the key of D, the C# serves as the leading tone for the key, making it a very important note. 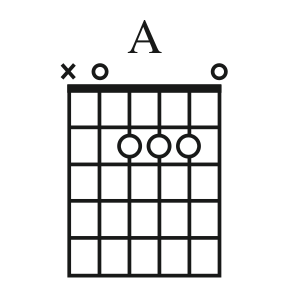 Consequently, when playing an A chord one might want to emphasize the A or the C#, but would less often want to emphasize the E.
If one were playing a guitar with the lower strings reversed (as I usually do), then the most prominent note of A-E-e-a-c#'-e' would would be initial A even though it's not the lowest note. When plucking rather than strumming I usually avoid the low E, but it's pretty harmless so long as it's not the first note played. When strumming a standard-tuned guitar, however, the only way to strum an A chord without the low E being the first note is to omit that note altogether. BTW, in some styles of bass-strum accompaniment it may be useful to have the bass line go between two notes of each chord; one should generally be the root of the chord, and the other should often be an "important" note in the key, such as the tonic, dominant (fifth), or leading tone (major seventh). In the key of A or E, it may be good to have an A chord that includes the low E following an A chord without it; that's less likely to work well in in D major, though. Not the answer you're looking for? Browse other questions tagged guitar theory chords or ask your own question.